This 15-Minute Sesame Noodles recipe is quick and easy to make and can be served warm or cold. Feel free to add in extra veggies or proteins (such as chicken, beef, pork, shrimp, tofu, etc.) if you’d like! This was actually one of the very first recipes that I shared on the blog way back in 2009, and it has been one of my back-pocket, most-used, and most-loved recipes ever since. As you can see, it’s ridiculously quick and easy to make, basically just taking however long your stove requires to heat and cook a batch of pasta. It’s tossed with a yummy simple sesame sauce made entirely with pantry ingredients. (So no chopping required!) It works goes well as a side dish with just about anything, or can also be gussied up with extra veggies or proteins to make it a main. It is just as delicious served hot outta the pan, or nice and cold as a pasta salad. 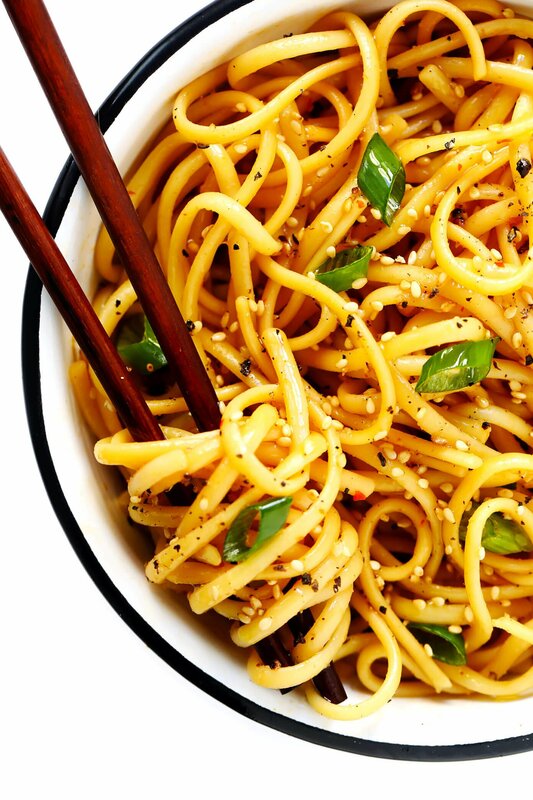 And most importantly — these sesame noodles are totally tasty. We make them constantly to serve with stir-frys, soups, salads or baked/grilled proteins. And they are always a hit with any crowd. So if you love noodles as much as we do, I thought I would bump this one back to the top of the blog today so that you can bookmark and keep in your back pocket as well!